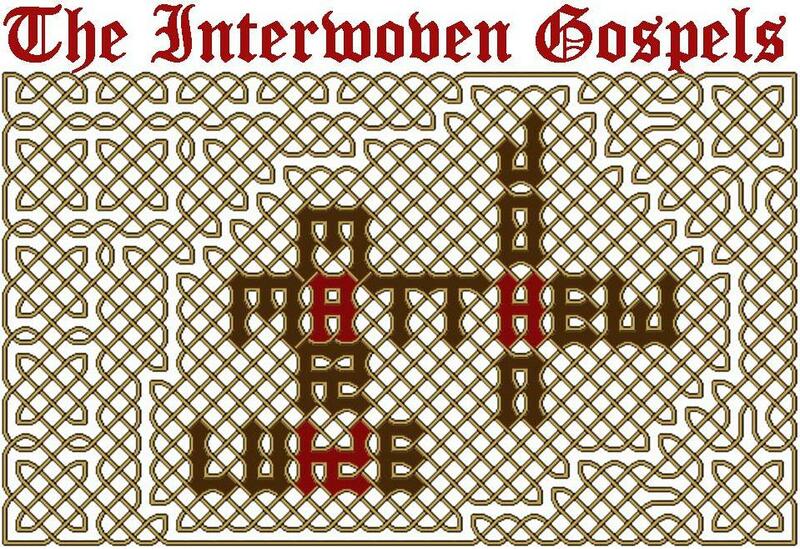 Preface: To create this updated Interwoven Gospels, I replaced the King James text in William Pittenger's version with the more contemporary World English Bible (WEB) translation. The gospel portion of Pittenger's original book was divided into 171 sections, some of which were much longer than the others. So, I split the longer sections until each subsection fit on a single page, and then I assigned one reading to each day. In this way, I created two daily Bible study cycles per year. One cycle of daily readings begins January 1 and ends June 30; the other begins July 1 and ends December 31. To each daily reading, I added a title, an Old Testament passage, and a "call-out box" to help you, the reader, quickly see the main themes in the passage. Finally, I wrote two rows of questions followed by the first line of a prayer. For the most part, the first row of questions asks about the reading, the second row asks about how it relates to your life, and the prayer—once you finish it in your own words—will serve as "stone of remembrance", documenting your commitment to obey God in the specifics of what he has taught you through that day's reading. I followed this same format when writing a study guide for My Utmost for His Highest. The people who used this Utmost guide told me that the prayer of commitment was their favorite, though most convicting, part of the study. This has also been my experience as I have used the study guide for my own devotions. If you are not starting this daily Bible study on January 1 or July 1, you may benefit from quickly skimming all previous readings (leaving the questions unanswered until beginning a complete cycle in the following January or July). After this quick read, you can then follow along with the normal daily schedule. Actually, I encourage everyone to go through all the readings in one sitting, since this is a great way to get a bird's eye view of Jesus' life and of the differences and similarities in the four gospels. For your convenience in this regard, I have compiled each month's daily readings into one document that can be downloaded by clicking on the month's name. Pittenger's preface to the original Interwoven Gospels: The design of this compilation is to take the four biographies of our Lord which are found in the New Testament, and combine them into a single narrative. As an inspired authority, and for the purpose of consultation and study, the common arrangement is no doubt far better than any other. But a mode of presentation which employs only the familiar Gospel words, which can be read in a few hours as a continuous narrative, and pet gives the whole story in a single impression, may be very useful. Each of the four Gospels is independent and has certain peculiarities that the others do not possess. It is curious and instructive to notice how some sayings and incidents in the life of Jesus are found in all four of the Gospels, some in three, some in two, and quite a large number in but one. In like manner the same incident will be narrated with greater or less detail in the different places where it occurs. A full conception of this marvelous history cannot be obtained till all the accounts are in some manner fused into one. The diligent student will make this fusion mentally, and perhaps unconsciously, but may not this essential process be greatly hastened by a careful combination printed and placed before the eye? Many persons rest satisfied with thoroughly knowing but one Gospel, while their idea of the other is hazy and imperfect. This is to be regretted. All the accounts are needed to give us the best attainable conception of the earthly life of our Savior. The reader who omits to give each Gospel its full weight in his conception of the work of Christ will be the loser. Very often what is obscure or perplexing in one account is made clear in another; and thus, when we know all that the four Evangelists have recorded, and have mentally arranged their accounts in due order, we have the best—or rather, the least inadequate—view of the wonderful human life of the Christ. It is hoped that this volume will interest and profit two classes of readers, perhaps in almost equal degree. If put into the hand of a child as his first introduction to the study of the New Testament, it will be read as an ordinary connected history; and when the Gospels in their common form are afterward read, the relation of their different parts will be at once understood, and many otherwise perplexing questions will never even arise. But a person who has been diligently reading the Gospels in the New Testament for years is equally sure to be delighted and instructed when he finds them all combined into one story, thus putting before his eye fully and in print what he has long been mentally approximating. There is a fullness in many particulars, a new light cast on the story from the order and succession of events, which is almost invariably a pleasing surprise, even to the well-informed. Many attempts have been made to perfect a combination of the Evangelists in their own language. The harmonies which give parallel accounts in parallel columns on the same page are valuable for the study of detached passages, but are unsuited for consecutive reading. Some attempts at making a single narrative have been very ingenious and useful; but none have hitherto been quite satisfactory. Some have attempted too much and by the use of cumbrous machinery have made the result unreadable, thus defeating their own purpose. The difficulties lie on every hand, and are much greater than would appear at first view. If the compiler adds many words of his own to make easy connections, the authority of the Gospel narrative is impaired; on the contrary, many omissions are fatal to completeness; while if every word from the four accounts is brought into the text, the style will be broken and involved, and there will be much wearisome repetition; if no references are given, the reader does not know what portion of the sacred record Ire is reading, and the sense of authenticity and security is lost; while frequent references, parentheses, and typographical devices disfigure the page and mar the reader's pleasure. These are by no means all the difficulties encountered, but they are sufficient to explain the limited nature of the acceptance that such works have hitherto met. Whatever may be its fate, the present attempt enjoys several considerable advantages. The issue of the Revised Version of 1881 furnishes a valuable aid. It is not only more accurate than the common version, but possesses two qualities which contribute directly toward the success of this undertaking. The renderings are far more uniform, and a large number of spurious readings have been removed, thus bringing the several Gospels in their English dress more close together, and rendering more easy the work of blending them smoothly. The labor of interweaving is thus reduced fully one half. Another great advantage secured by the Revised Version, is the placing of chapter and verse numbers in the margin, leaving the page to take the usual form of paragraphs. This renders it possible to retain the familiar notation by chapter and verse without change. The readings and renderings preferred by the American Committee of Revisers have been adopted because they carry still further the principle of uniformity in rendering. Fords, Howard & Hulbert have kindly given permission to use their "American Version," edited by Roswell D. Hitchcock, President of Union Theological Seminary, New York. A very simple device has removed many of the difficulties that have hitherto proved very formidable. When parallel accounts occur they are not woven together on equal terms, but one of them is selected as the standard either that one which is fullest, or which blends best with what precedes and what follows and only the peculiarities of the others are added. The Gospel, chapter, and verses of the standard account are as fully indicated as if it stood entirely alone, while the word, clause, or sentence from another Gospel is introduced by an inconspicuous character, showing the book of its origin at a glance. This mode of one account by a few carefully inserted additions has been found, after many trials, easier and far more satisfactory than to build up a new text out of the fragments of two, three, or four accounts. No attempt has been made to include every word, or every variation in the mere form of expression. That would be to sacrifice the substance to the shadow, and is the rock on which some learned and laborious compilations have been wrecked; but nothing which makes any addition either in fact or in expression has been knowingly omitted. The reader of this volume will be able to be in with the introduction of St. John and take up event by event of the Savior's life in the words of each Gospel. Where there is one account only, this is simply inserted; but where several occur, the fullest is given with all the additions that the others make. In choosing these additions where they are found in more than one Gospel, the same principle of choosing the fullest and most important first is adopted. The order of time where it could be determined has been followed in all ordinary cases; but to preserve the unity of subject, and to avoid cutting the different accounts into minute fragments, the order of subject has sometimes been preferred, with a clearly marked statement of the chronology as well. The compiler does not claim the authority of an original investigator in the field of Gospel harmony, but has carefully studied the works of the great masters in that field, and has made such a selection as seemed best for the purpose in view. The succession of events in the majority of instances has been determined by general consent. Where doubts exist, reasons have been carefully weighed; and where absolute certainty seems not attainable, that arrangement has been preferred which makes the clearest and most intelligible biography, and least disturbs the association of events with which we are familiar in the Gospels themselves. For instance, the Sermon on the Mount has been given as separate from the very similar discourse in Luke, against the views of the majority of harmonists, because this allows the presentation of two noble discourses in unbroken flow, keeps for each the position with which Bible readers are already familiar, and permits a more natural arrangement of the early part of our Savior's ministry. The same considerations apply to the long passage in Luke from the 9th to the 19th chapter, which is by many harmonists broken into fragments and distributed in various places—hardly fair treatment for an evangelist who professes to write "in order." It has seemed much better to follow the leadership of Dr. G. W. Clark in placing these chapters almost in a body-an arrangement probable in itself, and far better for the purpose of biography. A few questions of harmony are treated in notes, and a few specimen modes of reconciling discrepancies but only a few, for this work is not intended to be a commentary. Agreements are far more numerous than differences, which are only such as to prove the independence of the Gospels; but it is not our purpose to call attention even to the most striking confirmations. If all the marvelous wealth of the four Gospels can be thrown into one smooth and continuous narrative, we will be well content to let the story make its own impression. The advantages claimed for "The Interwoven Gospels" may perhaps be clearly conceived by imagining the four Evangelists to be reciting orally the wonderful things they had seen and heard. If each in turn told the whole story so far as he recalled it in one uninterrupted effort, we would have some things told but once, some twice, and some four times; the order of events would differ, and there would be many verbal variations. This would be putting their story in the very strongest possible form as evidences in a court of law; though any story less interesting than that of the Gospels would become tedious when told four times over in such a manner. But in this volume one evangelist relates an incident, and the others add the particulars that their memories supply; then another carries the story forward, and is supplemented in like manner; and this is continued until the whole incomparable story, from the Annunciation to the Ascension, is placed before us, without repetitions, and on the authority of the four witnesses. Can there fail to be a gain in ease of reading, and in freshness and unity of impression? No doubt, if we at the same time lost the original four Gospels, the evidence upon which rests the history of Christ would be weakened; but we do not lose them, and the convenience with which they may be referred to is one of the merits of the present volume. A reader who uses it will be better able, from comparison with the combined account, to appreciate the characteristics of the several gospels. Original thoughts on the "CHARACTERISTICS AND AGREEMENTS OF THE GOSPELS": No one of the four Gospels is in the form of a modern biography. They contain comparatively few notes of time, and do not always observe chronological order. They are professedly incomplete, giving only a partial record of a life which even inspired pens could not fully write. (See John xxi. 25, and the frequent reference to the "man other things that Jesus did.") Naturally they did not always select the same matters for record or the same particulars and phases of the same event. Their complete independence is thus made evident; and in these four vivid, artless, and most truth-like sketches of a marvelous life there is laid a firm basis for faith. The more they are studied the more the conviction grows of the absolute impossibility of the Gospels originating in any other way than through the attempt of honest men to state what came within their own knowledge. Our space will only permit a bare statement of a few of the characteristics of the several Gospels, without giving the evidence on which the statement is based. Those who are interested can easily continue this line of research with the aid of competent investigators. Matthew (though a publican) is especially interested in those phases of the life of Jesus which fulfill the Old Testament predictions regarding the Messiah. His is the longest Gospel. Mark is supposed to write under the dictation of the Apostle Peter, or at least in direct consultation with him. He places less stress on what is said than on what is done; has few long discourses, though many pithy sayings; but in few words photograph the surroundings and minute details of the Savior's “mighty works." The narrative has the hurry and impetuosity of Peter's own character. The word "straightway" is ever recurring. Matthew and Mark are mainly occupied with the works of Jesus in Galilee, and their accounts run more nearly parallel than any other two. Luke, at the outset, claims to set forth events "in order." He is therefore much more full in the introduction to the ministry than the other three, and gives many miracles and parables occurring beyond Jordan which they omit. There is a rounded fullness in his accounts which suits well with his Greek name. Tradition represents John as writing later than the others, with the especial purpose, indicated in his introduction, of showing the Divinity of Jesus. He alone gives the works done at the several Passovers, and thus furnishes the only available means of computing the length of the public ministry of Jesus It is also natural that the discourses at Jerusalem, the scholastic and priestly capital of the nation, should be more profound and doctrinal than those uttered to Galilean peasants. A careful study of the relations of the Gospels reveals the wonderful manner in which they supplement each other. Without Matthew we would lack the Sermon on the Mount; without Mark, a hundred striking details which could have come only from an eye-witness; without Luke, the prelude of angels and the parable of the Prodigal Son; without John we would lack the conversations with Nicodemus and the woman of Samaria, and the matchless pathos of the last discourse. All of these, and many more, are presented here in regular order, and with careful consideration, but without the perplexities of minute criticism; and each narrative is so indicated that the reader will always know, without the trouble of reference, just which Gospel he is reading and from source each particular is added. In preparing this compilation the lovely and mighty figure of JESUS, THE CHRIST of prophecy,—the SON OF MAN, and the SON OF THE LIVING GOD,—has seemed to become more definite, and to draw ever nearer. May this experience extend to all readers!